Sticking needles onto his eyes, torso and nails. Buzz could only wail in pain as the many toys that surrounded him cheered. Little Bo Peep and Cinderella were cursing from the sound of his suffering, Gollum and Wolverine screeched in madness at the sight of needles piercing his skin, only Merlin was indifferent. A fleeting glimpse of his life beckoned over Buzz as he felt a burning pain fill his body. It was true, he felt, that at the moment of death you are able to see back to how you had lived. Buzz saw his good friend Woody and their countless adventures at the house of his previous owner, Andy. 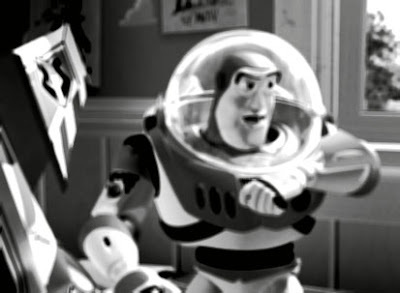 Buzz saw how happy Andy was the day he first opened the same box which would 12 years later become his casket. At the hands of his new owner, the young Fifi, to whom he had been sold. Andy had grown and needed less space in his cabinet. The fledging astronaut had to leave. Days later and Buzz learned that he was now in the hands of evil. Her room was dressed in black with death lurking in every corner. The toys in her lair had surely been infected with the witchcraft that the young Fifi had mustered. They had grown mad from the torture of their master – Wolverine’s limbs were torn, Merlin had been fed with dirt from the ages he had been sitting at his corner, Little Bo Peep’s head had been torn and Cinderella’s once fair skin had been brushed with stain. Buzz gulped from the torment he now has become a part of. He knew he was gonna suffer the same madness if he did not escape. Exclaiming proudly as he had done countless times before, Buzz ran out of the box onto the floor in a daring attempt to escape. He ran off by the door to escape the monster. Ah, but Fifi was quick to noticed the astronaut and immediately caught him. Fifi grabbed Buzz and pounced him back in his place with the same needles she had used on the face of Gollum. Now, crucified on a cupboard, Buzz takes his final breath with a sight of the friends who had abandoned him. Anyway, I would love to see that fifi in action, tormenting toys and all!